Bob Sandford is the EPCOR Chair for Water and Climate Security at the United Nations University Institute for Water, Environment and Health. He is the co-author of the UN Water in the World We Want report on post-2015 global sustainable development goals relating to water. In his work Bob is committed to translating scientific research outcomes into language decision-makers can use to craft timely and meaningful public policy and to bringing international example to bear on local water issues. To this end, Bob is Senior Advisor on water issues for the Interaction Council, a global public policy forum composed of more than thirty former Heads of State including Canadian Prime Minister Jean Chretien, U.S. President Bill Clinton and the former Prime Minister of Norway, Gro Brundtland. Bob is a Fellow of the Centre for Hydrology at the University of Saskatchewan and a Fellow of the Biogeoscience Institute at the University of Calgary. 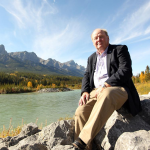 He sits on the Advisory Board of Living Lakes Canada and is a member of the Forum for Leadership on Water (FLOW), a national water policy research group centred in Toronto, ON. In 2013, Alberta Ventures magazine recognized Bob as one of the year’s 50 most influential Albertans. In addition to many other books, Bob is the author of a number of high-profile works on water, including Cold Matters: The State & Fate of Canada’s Snow and Ice, and Saving Lake Winnipeg. Bob co-authored Flood Forecast: Climate Risk & Resilience in Canada with Kerry Freek. His latest book, The Columbia River Treaty: a Primer was published in association with Simon Fraser University’s Adaptation to Climate Change Team in the fall of 2014. All these publications are available from Rocky Mountain Books.